As warm days approach, do you find yourself thinking about getting outside more and how you can enjoy your own backyard? This month’s “Project Spotlight” showcases an outdoor living room that provides a great place to relax and entertain with an adjacent open-air patio setup for cooking, dining and gathering by a fire on a cool evening. This home is located in a community where backyard space is limited. The existing backyard was a narrow space with a slope pitched toward the home. 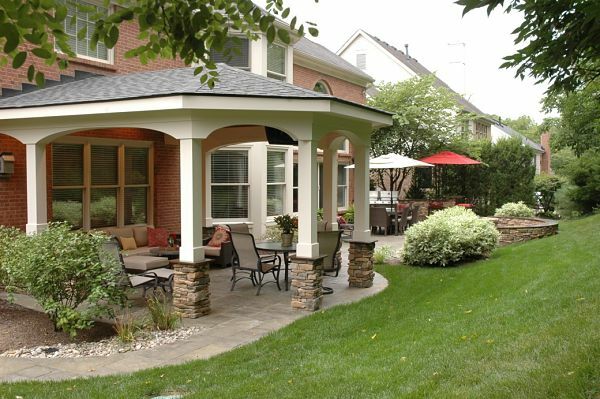 When the home was built, a small round patio was added. 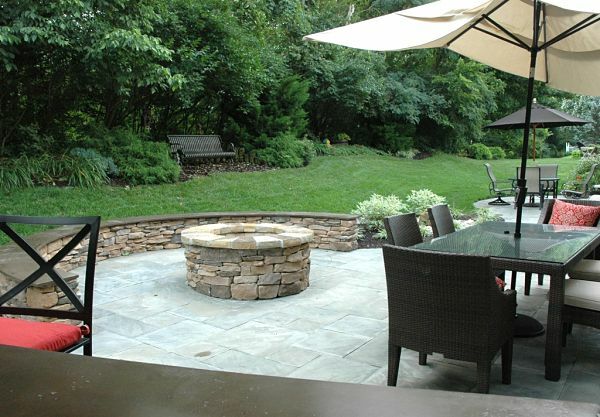 There was no shade and the rest of the yard was taken up, in large part, by landscaping that created an obstacle to adding some of the items the homeowners desired, such as a fire pit and a functional grilling area. Since the home is located in proximity to neighboring properties, privacy is an issue and the design needed to be considerate of other homes and neighbors. Make better use of the square footage along the back of the house and improve the visual appeal. Provide privacy from neighboring homes. 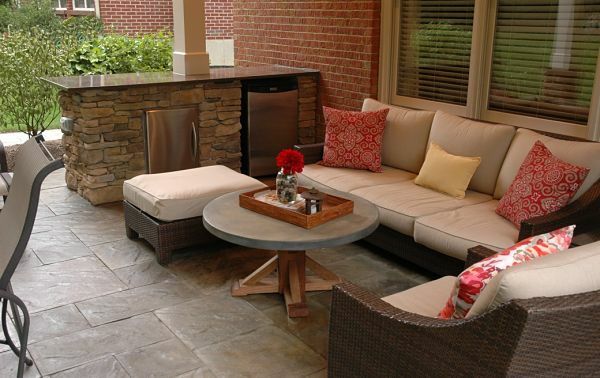 Have an area that would be sheltered from the sun and rain where they can relax, entertain and enjoy the backyard. 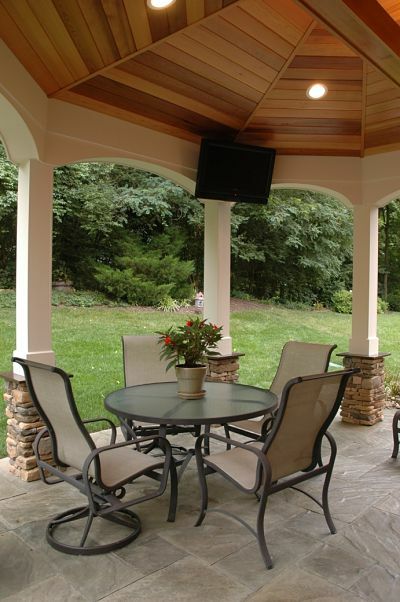 Bring in-home conveniences outdoors including a beverage refrigerator, icemaker and television. Have a functional outdoor kitchen with a gas and charcoal grill, food prep space, storage and a bar counter area for serving food and drinks. Include a firepit and seating area. The backyard was redesigned to include three new zones: 1) a covered outdoor living room which would provide an area for seating and placement of appliances, 2) an open patio for cooking and dining, and 3) an area for the firepit. 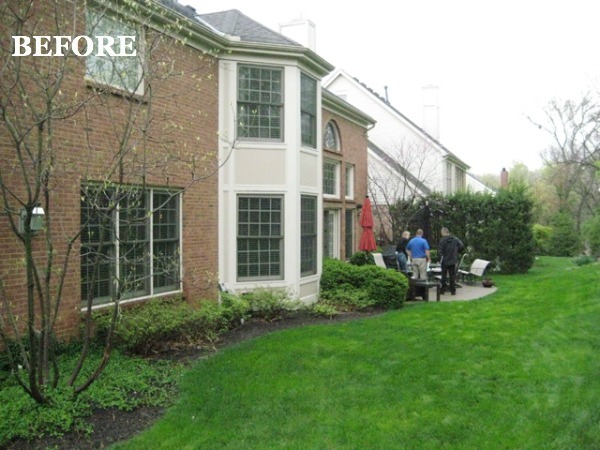 By utilizing the entire length of the backyard, and extending pavers to the base of the incline, the backyard was transformed into a highly functional, spacious extension of the home. 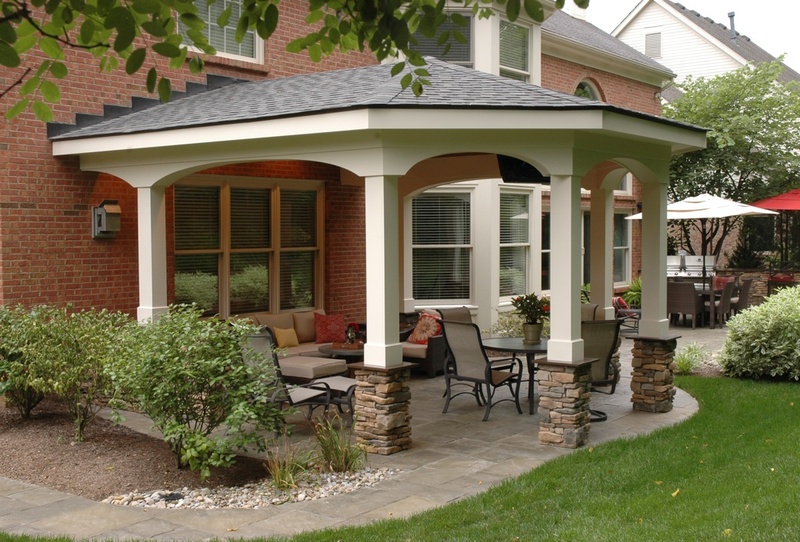 The design of the covered patio was compatible with the colonial brick architecture of the home. A stacked stone wall was added to provide privacy and serve as a base for a counter in the sitting area, food prep area and a bar for entertaining. Establish a backyard redesign to complement the architecture of the home that did not severely inhibit the views from the interior. Work within the footprint and grade of the backyard. Incorporate all of the items on the homeowners’ wish list. 1. Creating a structure that complements the home and does not interfere with views from the interior. Visual aesthetics were important to the homeowners. The inclusion of a covered area patio in the backyard remodel presented a unique challenge. The only available space for the structure, as dictated by the position and shape of the windows on the house, was outside the triple frame family room windows. Unfortunately, a window on the second floor meant that the space for connecting a roof to the house was vertically limited, and affecting the slope of the roof. To counter the shortness of the roofline, the whole structure was built with a higher profile and longer support columns. To help the roof feel more spacious on the inside, beams were installed to create the illusion of a high vaulted ceiling. The interior ceiling is paneled with stained fir, and lights recessed into the top of the beams provide up-lighting. 2. Working within the footprint and grade of the yard. The footprint of the original patio was fairly sufficient for outdoor dining. To accommodate the homeowners’ wish list items of a grilling station and firepit, that footprint was pushed against and into the incline, and connected to the covered area with a meandering walkway past the bay windows of the home. 3. Incorporating the homeowners’ wish list features into the yard. Outdoor kitchen. 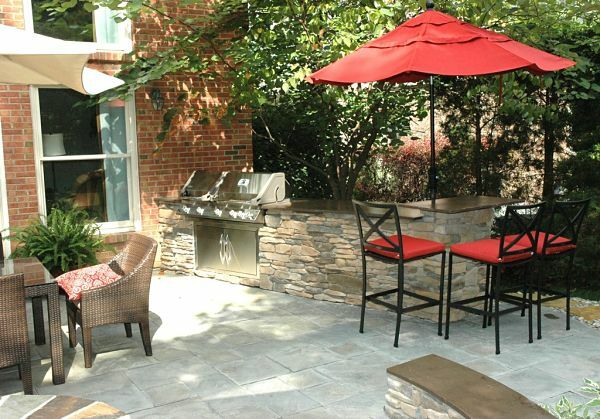 The grill was built into a stacked ledgestone wall of the open-air patio area. Panels under the grill offer convenient storage and access to the grill gas line. A stone counter was created by the architectural cap on the wall to provide a space for food prep and a serving style buffet. Outdoor bar. A bar area was created at the end of the wall by raising the wall at that point to bar-height and capping it with an oversize stone counter. The bar provides seating for three. Firepit. The firepit area was designed to allow ample space to safely walk around the fire ring, and a semi-circle stone bench doubles as a retaining wall against the incline. The firepit is gas, eliminating the need for wood storage in the space. Outdoor TV. The homeowners had a specific television size requirement, but also wanted the unit to be as inconspicuous as possible. The interior structure of the ceiling, which had been pushed as upward as possible, was exploited for the TV placement. In addition, to provide further concealment from the exterior, arched valances were installed between the beams, which also complement the arched window of the home. Outdoor appliances. Because the homeowners enjoy spending time outside and entertaining guests, they wanted to add an outdoor beverage refrigerator and icemaker to the space. These appliances were built into a ledgestone wall in the covered patio area. The wall is capped by a stone counter for serving drinks and food.